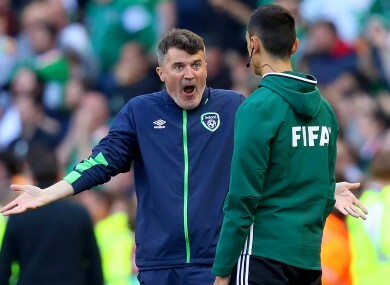 Keane reacting after Ireland's disallowed goal on Sunday. EAMON DUNPHY HAS questioned comments from Roy Keane in the build-up to Ireland’s World Cup qualifier with Austria. The assistant manager talked about “going into battle”, people who have “died for their country” and “putting bodies on the line” ahead of Sunday’s clash at the Aviva Stadium. But the Boys in Green were flat in the first half and needed a late equaliser from Jon Walters rescue a 1-1 draw. Speaking on Game On last night, Dunphy, who ghost-wrote Keane’s first autobiography, claimed Martin’s O’Neill’s right-hand man is given too many opportunities to comment in the media during international weeks. “All that ‘war’ talk out of Keane on Friday, that’s wrong,” Dunphy said. “I don’t even know who the England assistant manager is and I doubt if you do. The outspoken RTÉ pundit also criticised Ireland’s team selection — particularly the omission of Wes Hoolahan and the positions that Robbie Brady and Jeff Hendrick lined out in. “As soon as I saw the team sheet, I knew there was no way… and I said it,” he added. “If you pick a team like that, leaving Jon Walters on his own up front, he simply can’t do it at his age. He’s a fantastic lad, great pro, great lad. No Wes [Hoolahan], two centre-halves who’d never played together in a competitive match. One of them has played three games in the Premier League. John O’Shea was sitting on the bench. “Robbie Brady is no good in midfield. He wasn’t in the Burnley team, he’s a left back and he’s a brilliant footballer plus his set-pieces are really good. McClean was playing as an auxiliary centre-forward and Jeff Hendrick was playing in a position he’s probably never played in his life, with his back to goal. Email “Dunphy criticises Keane for the 'war' talk before Austria qualifier”. Feedback on “Dunphy criticises Keane for the 'war' talk before Austria qualifier”.